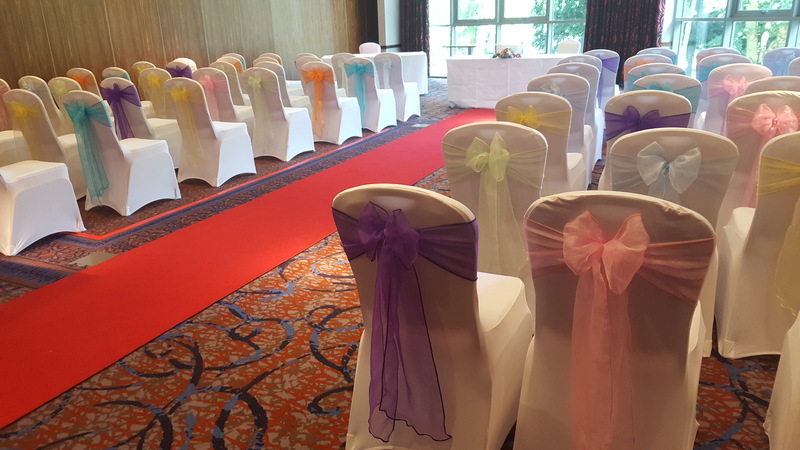 Choosing your wedding colours can be really tricky. Especially as there is so much inspiration and gorgeous colours out there to choose from. The majority of people will pick a colour and use that as there theme with it running through most items. Think about your base colour. 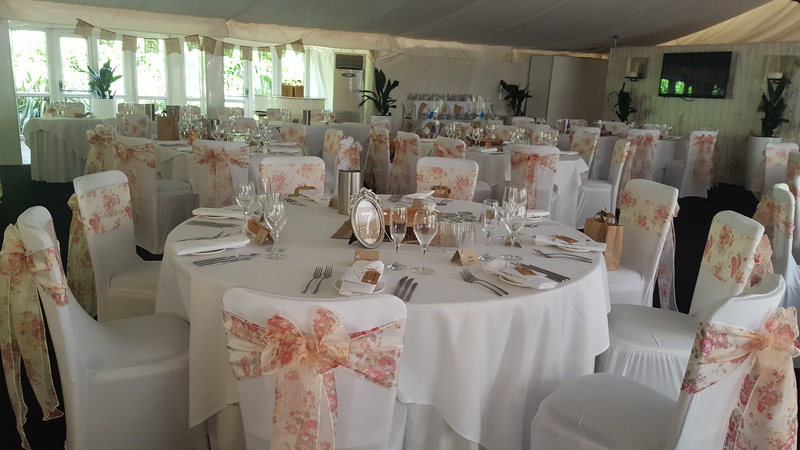 This will often be a neutral colour, matching your linen at your reception venue, your flowes, even your wedding dress. Most people will stick with white but could be ivory, cream, blush pink. Use this as a good starting point to build on. 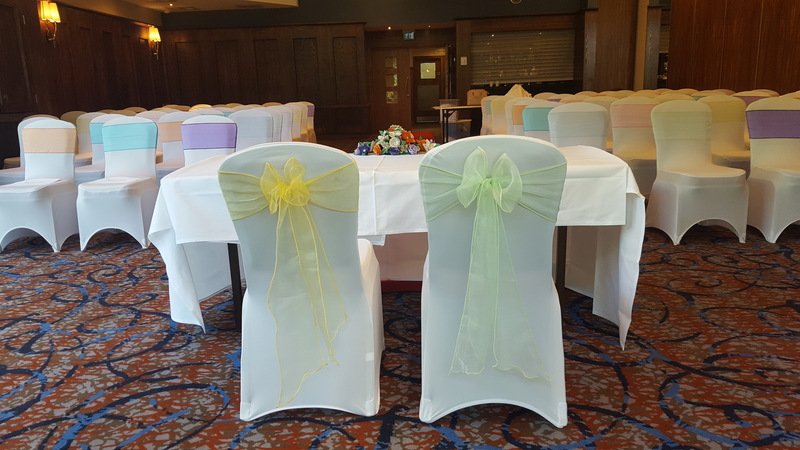 The next step is to then choose the colour which will often run through your Bridesmaids' dresses, stationary, centre pieces, chair covers, flowers etc. 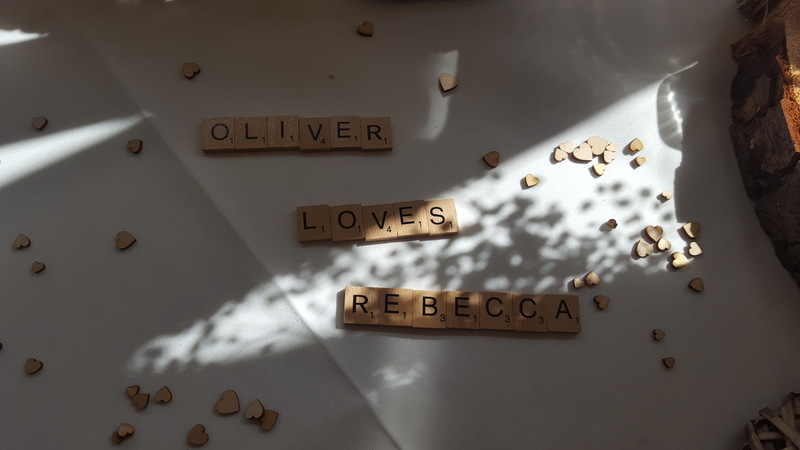 This, more often than not, will give couple's a headache trying to deliberate over. Now most of you will stop at choosing your colours as by now, you are sick of looking at colour charts and going back and forth between royal blue or electric blue?! But why not consider adding elements and textures such as wood, lace, sequins, lighting? All these elements should compliment steps 1 & 2. 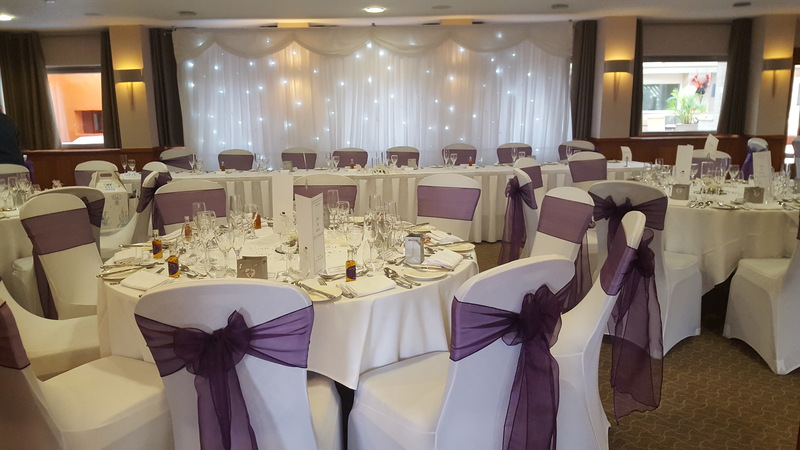 Why not add a lace overlay to your sash and table runners? 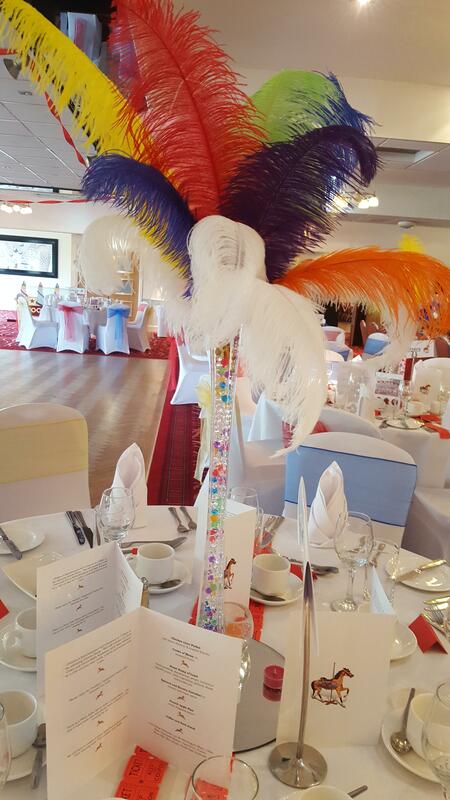 Put a sequin table cloth on your top table to make it the focus of the room? 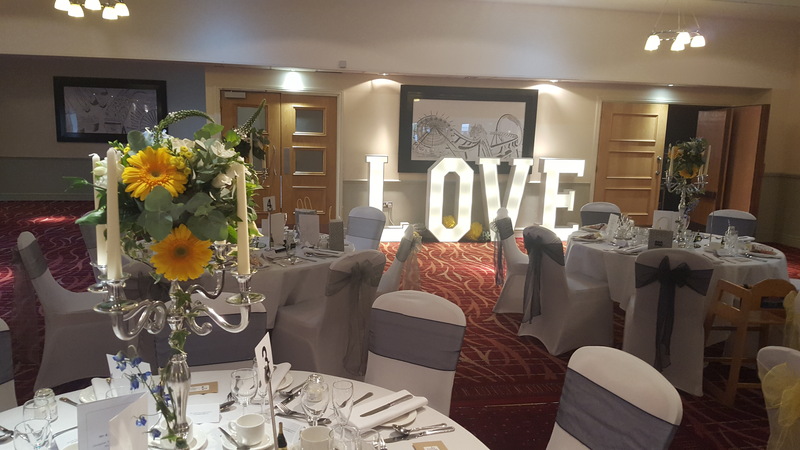 Lighting is crutial to your venue, think about adding fairy lights, LED lighting for your centre pieces, uplighters around the room or LOVE letters. All these items will also make really great photo opportunitites. What ever your theme, think beyond just the colours. 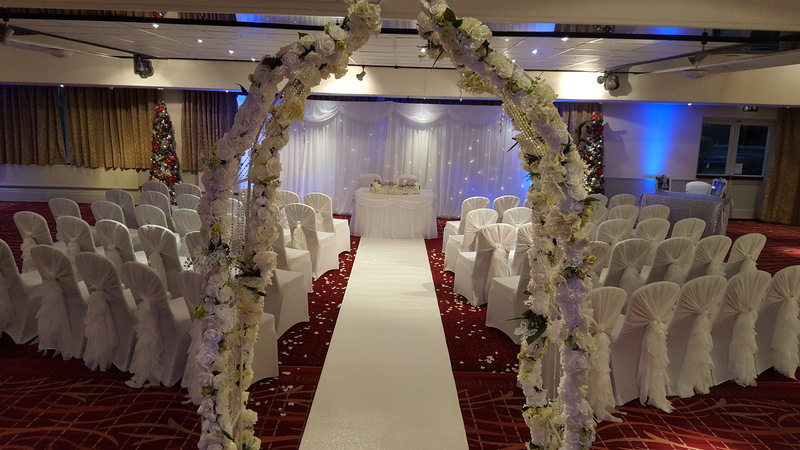 We first me the beautiful Rebecca at a wedding fayre where she totally fell in love with our floral sash. 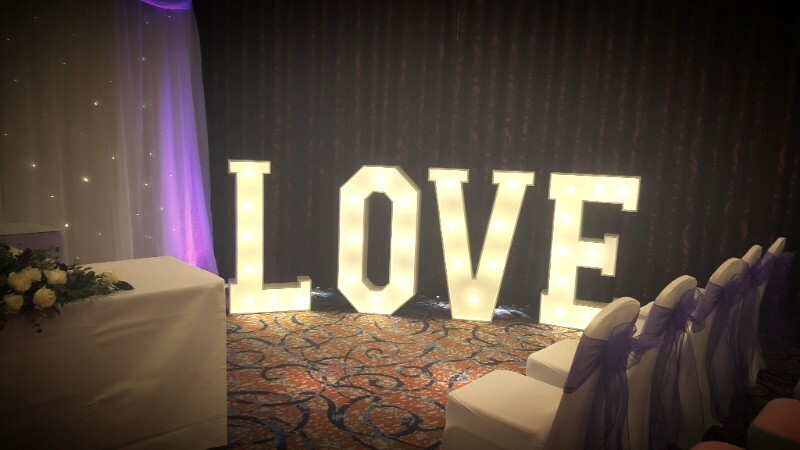 She knew she had to have it as part of her decor as it perfectly matched her theme, and boy did it? 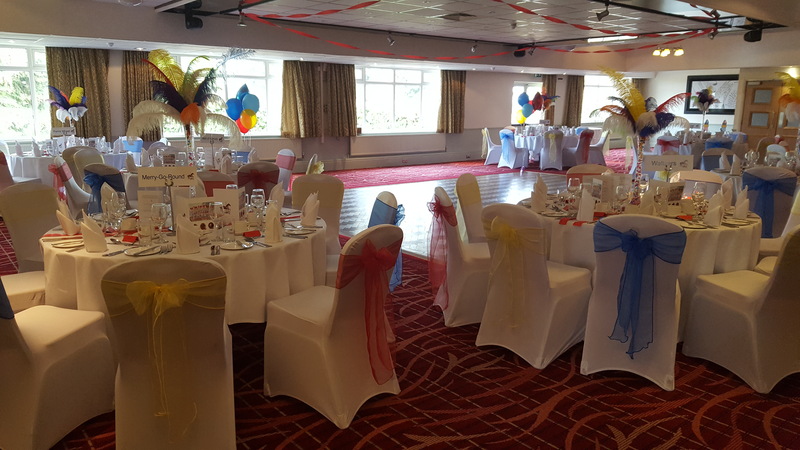 This bright, colourful event was perfectly placed at Drayton Manor theme park - why? Because of their theme - Fun Fair! 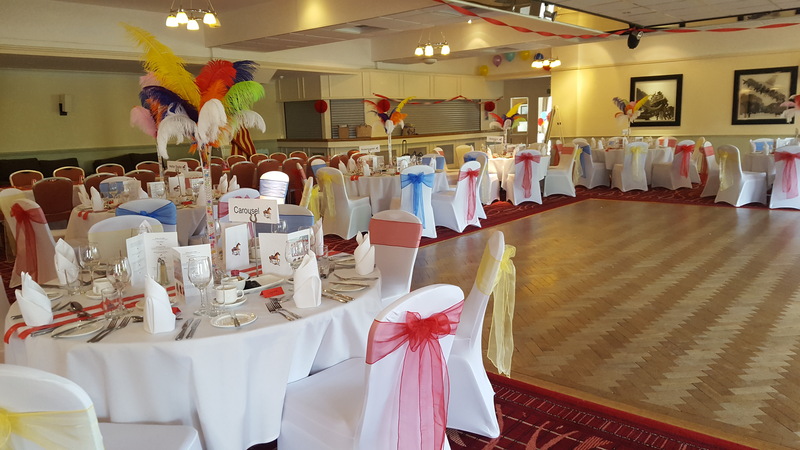 With the staple colours of red, yellow & blue we worked on creating a fun atmoshphere with the chair covers, ostrich feather centre pieces, ticket reels for table runners and not forgetting - balloons! 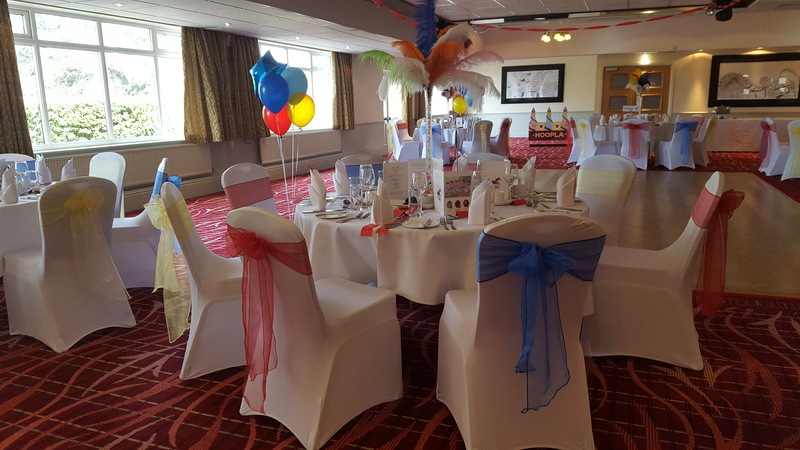 With the help of some fun fair games dotted around the room, everyone had plenty to keep them entertained throughout the evening. 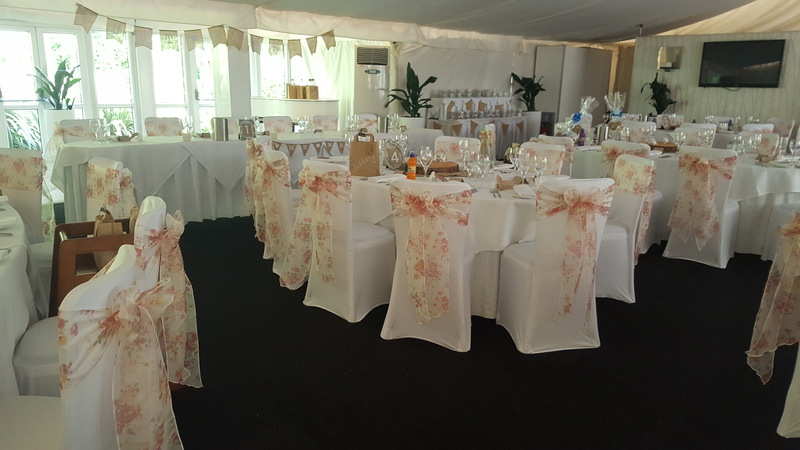 The Wedding of Tess & Amanda took place at Drayton Manor Park on a lovely hot summer's day. 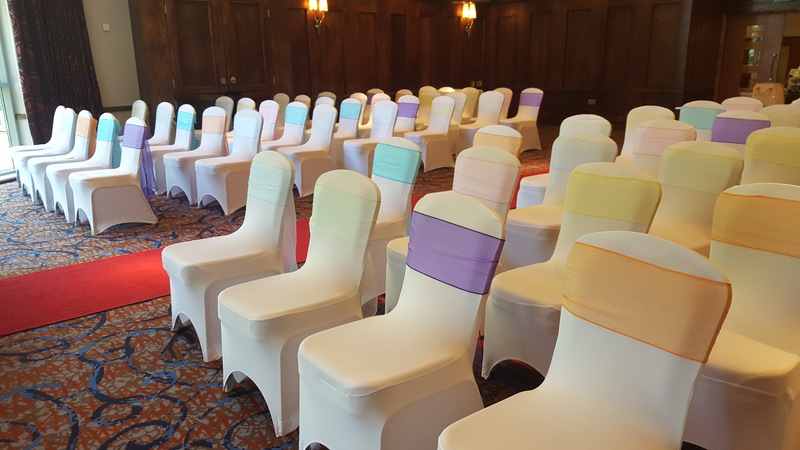 Their choice of colours for the chair sash filled the room with warmth & sunshine. 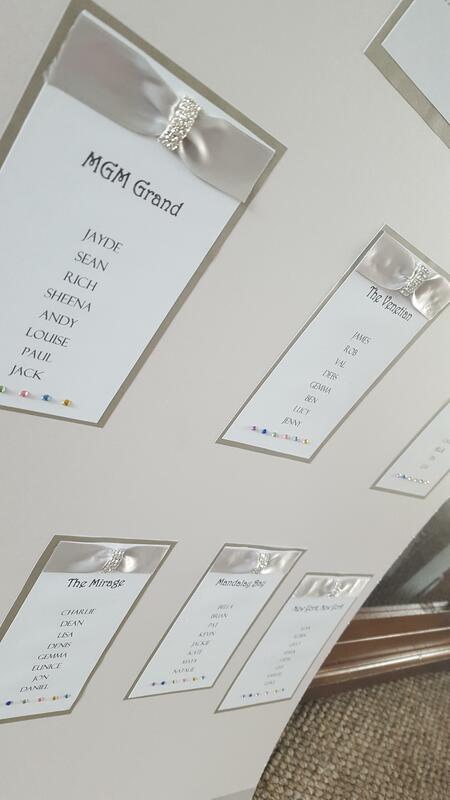 We also created and designed a table plan for the happy couple which tied in nicely with their colour scheme.